General fitness and well-being has been a quick win for the Internet of Things (IoT). Activity trackers and wearables are providing an addictive mix of data updates – steps are recorded, calories counted and sleep patterns monitored. Millions of people are using apps and web portals to monitor personal progress, set goals or craft that perfect Facebook brag about reaching 15,000 steps in a day. Baby boomers aren’t eyeing nursing homes with any enthusiasm, but remote monitoring makes staying at home more feasible. Relatives or caregivers are texted when motion sensors notice a failure to get out of bed as usual, gyro sensors will send an alert if sudden movements suggest a fall and noise sensors are activated by a cry for help. This remote monitoring has the potential to generate serious savings for the healthcare industry. McKinsey Global Institute estimates using it to track patients with chronic diseases, so doctors only need to visit when there’s a problem, could amount to annual savings of $US1.1 trillion by 2025. There are further savings to be made when medical professionals can check on a patient at home, freeing up hospital beds. In a test of one device, nurses remotely monitoring vital signs reduced hospital stays by an average of six days, saving $US5000 per patient. It’s not just patient monitoring, either. Some medications require precision timing so there’s great benefit in pharmaceuticals with ingestible sensors that can pinpoint arrival in the stomach. One German start-up, Insulin Angel, has created a sensor to ensure insulin is stored at the correct temperature and within reach of the patient. Failure to take medication correctly results in $US100 billion worth of avoidable spending in the US each year, according to McKinsey & Company. Sensors are an effective way to monitor patient behavior, helping to ensure they’re taking the right medication at the right time. Most people are already familiar with automated texts confirming a doctor’s appointment. Britain’s National Health Service (NHS) estimates that missed medical appointments cost a whopping £1 billion annually. A study published in The British Journal of Cancer found that women who received a text message reminder were 20 per cent more likely to attend a breast cancer screening appointment (and three times more likely to cancel if they could no longer attend). The IoT also encourages best practice in healthcare professionals. We’ve come a long way from pre-germ theory days, when doctors went from morgue to maternity ward with barely a hand wash, but there’s still much room for improvement. Poor hygiene contributes to healthcare-associated infections that kill nearly 100,000 Americans each year, according to the Centre for Disease Control, and fighting such poor practices costs US hospitals up to $US29 billion every year. When one US hospital installed sensors monitoring its handwashing stations and published a league table, compliance quickly increased among staff keen to improve their standing. Statistics show we’re far more likely to be killed by our lifestyles than infectious diseases or car accidents. This makes Benjamin Franklin’s argument that “an ounce of prevention is worth a pound of cure” a worthy mantra for the healthcare industry. The World Health Organisation reports that non-communicable diseases such as cardiovascular disease, cancer, respiratory disease and diabetes kill 38 million people each year, predominantly in low and middle-income countries. Unhealthy diets, physical inactivity, exposure to tobacco smoke and the harmful use of alcohol all contribute to premature deaths. The IoT provides a cost-effective way of tackling this global issue, as demonstrated in a 2006 study of a web-based weight-loss program. Participants who were given computer-automated behavioral counselling recorded similar average weight loss to those receiving it from humans, significantly more than those who had no counselling at all. It also allows medical professionals to work with patient influencers, with research suggesting people are very likely to follow treatment advice from friends and family. A visit to the emergency room or specialist usually starts with the patient explaining their present issue and medical history. They’ll often need to do this more than once as they move through the diagnosis and treatment process. This is time consuming for already stretched staff and relies on accurate patient recall. When patient medical histories are stored on radio-frequency identification (RFID) chips, all of this information can be relayed quickly and accurately, perhaps from the ambulance during an emergency situation, allowing triage before the patient arrives. As they move through the hospital, patient and equipment sensors can identify bottlenecks to reduce waiting times. Accurate data collection and effective communication are the cornerstones of effective medical treatment. 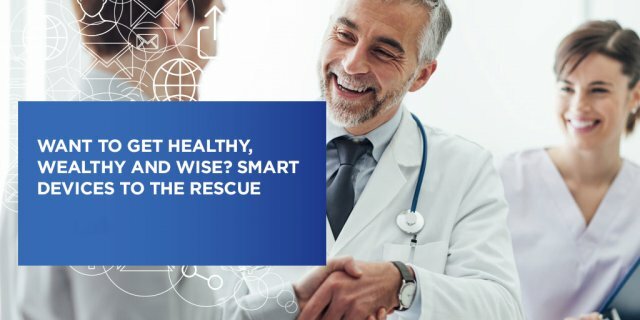 As the IoT improves our ability to do both, faster and more targeted treatment will deliver big payoffs for everyone. Download our free e-book to learn more about how you can improve the health of your business with IoT applications.